Looks like we’ve got another related card. 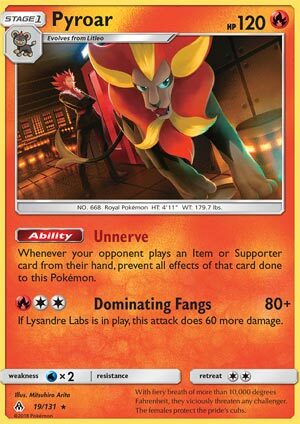 Pyroar belongs to Lysandre, as you’ll see in the background. It is a Stage 1 Fire type with 120 HP, weak to water, and a retreat cost of two. It’s ability, Unnerve, protects itself from item and Supporters. I suppose that’s to stop Guzma, Pokemon Catcher, and Enhanced Hammer from affecting this Pokémon. Dominating Fangs costs RCC for 80 damage, plus 60 more if Lysandre Labs is in play. Lysandre Labs is a Stadium card that makes Pokemon Tools have no effect. Pretty double-sided, neither player can benefit from disabled Pokemon Tools (although it can still be attached). No Float Stone for free retreat or even Choice Band for extra damage. So Pyroar can 2HKO at best and OHKO most Grass/Metal whose Fire Weakness is found. You can use Professor Kukui for 20 damage boost, or you can evolve it into Pyroar BREAK to make it durable at 160 HP while launching Kaiser Tackle for 180 damage. The self damage is pretty bad, unfortunately, so if you’re going to use it, then it means you found a target to OHKO, which is not many, but some. This card isn’t bad, but it doesn’t provide enough punch then, say, the Cynthia/Garchomp combo, and that can benefit on Tools. If only Lysandre did something for Pyroar as well…except he’s on his own as a Prism Star card and a Expanded regular self that wields the Gust of Wind effect. Pyroar (FLI 19) roars into the format out of the Forbidden Light expansions set. This 120 HP Fire type Stage 1 Pokemon really caught my eye for one reason: its ability Unnerve prevents your opponent from Guzma’ing or Hammering it. Much like the Omega Trait Barrier found on Electrike (PRC 60), Pyroar is completely impervious to any Trainer card played on it. I had tried this with Xerneas Break back in May in just a couple of matches (1 W 2 L), and then I tried it last week as a feature Pokemon (0 W 5 L). I am not particularly hot on this card. My main problem with Xerneas Break was that you usually need to attach energy to Xerneas, so you don’t often get to attach to Pyroar – but it is a good bonus when you do. Unfortunately, you can’t Elixir onto Pyroar the same way you could Electrike. And then as a feature Pokemon, it really wants for Choice Band or Wishful Baton. Unfortunately, neither function while Lysandre Labs is in play, meaning this card maxes out at 140. Sorry, Pyroar, you’re more like Pywhimper in Forbidden Light. I’ll probably try it again in a Xerneas Break build. I’d better hurry up though as Standard format ends for me in just a little more than 6 weeks! It’s interesting that in the TCG, they’ll usually only depict one particular version of a Pokemon and not the other. For instance, how many times could you spot the difference between a male and female of the same Pokemon? Pikachu doesn’t count, for the record – he’s got so many cards, it’d be hard not to find a pair. Pyroar is a Stage 1 Fire Pokemon, 120 HP, with a Water Weakness, no Resistance, and a Retreat Cost of 2. His Unnerve Ability lets him remain unaffected by the effects of your opponent’s Item or Supporter cards, while Dominating Fangs is a 3-for-80 move that does 60 more damage if Lysandre Labs is in play. For those who missed out last week, Lysandre Labs is a Stadium card that nullifies the effects of all Pokemon Tools. In theory, Pyroar can remain virtually untouched as he dishes out 140 damage with Lysandre Labs in play, effectively 2HKO-ing anything in the game without having to worry about getting switched out by cards like Guzma or the OG Lysandre. The problem is that you’re building a Stage 1 line-up centered around a Stadium card, all while devoting 3 Energy to it, and you’re hoping your opponent…won’t have an attacker lined up? Not likely mid-to-late game. Pyroar’s got some interesting characteristics, and he could potentially put a soft-lock on the opponent, but aside from being a mild inconvenience, I don’t think Lysandre should be any more reliant on this Pyroar than we should be. Arora Notealus: I only bring up the whole gender thing because Pokemon like Pyroar have very distinctive gender differences between the male and female counterparts. Out of all the different Pyroar cards, none of them depict the female form, which is ironic considering that the female Pyroar vastly outnumber the male Pyroar in the games, with males consisting of about 1/8th the population. Just saying, maybe they should be drawing more female Pyroar? Side Review: Mysterious Treasure – after a few weeks, it’s nice to look back and see what’s made an impact this set. Overall, Mysterious Treasure has been a big boon for Psychic and Dragon decks, and it’s been seeing major play in Ultra Necrozma-GX decks as a means of getting the heart and soul of the deck out and about. Definitely worth keeping in case another Dragon or Psychic attacker shows up that’s big! Next Time: Opening up its dark expanse, the new GX descends!